Many things may contribute to odor on a curling iron. Dirt and oils from the hair plus styling products, such as gels and hair sprays, that have burned onto the iron are the usual culprits. If you do not remove the source of the odor, some of the odor may transfer to your hair when you use the curling iron. The best way to remove the odor is to give the curling iron a thorough cleaning. 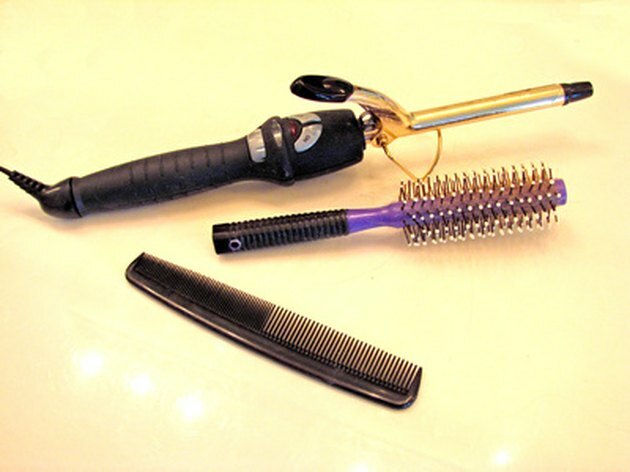 Residue can easily build up on curling irons and can cause odor. Unplug the curling iron--although the risk of shock is probably low, you should never clean a plugged-in appliance. Allow the curling iron to cool down, if it has been on. Wet a cloth in warm water. Sprinkle 1 tbsp. of baking soda onto the wet cloth and then sprinkle a few drops of water over the baking soda so it makes a mildly gritty paste, as suggested by Good Housekeeping and Dot Com Women. Rub the past over the curling iron to remove styling product build-up and other residue. When you are finished cleaning the curling iron, use another damp cloth to rinse the iron (do not submerge the curling iron in water--doing so may allow water to seep into the advice, which may remain and pose a shock hazard).